In case you're wondering, we're skipping the Take Two of #57 and jumping right onto to #58. I changed mine up a little from the sketch, but kept some of the main themes- using a group of 3 type image and using some scallops. 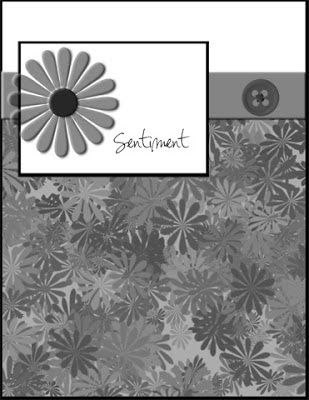 Although the original sketch was designed to make a narrow card, I decided to go with the standard 4.25 x 5.5. Latte Love. Heads up, this one is retiring forever in May, so if you like it, go get it! I trimmed off the bottom two cups to make it a stack of three. I coloured the cups with a mix of Copics and Stampin' Up! markers. 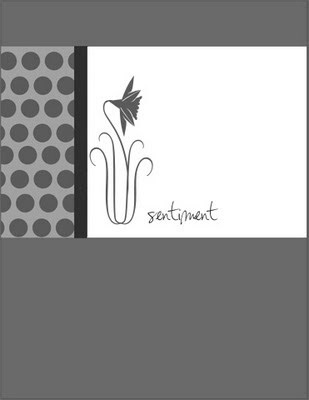 I finished it off with a sentiment from that same stamp set, as well as a few Nuvo drops. Happy Sunday everyone! Here's my card for this weeks sketch! 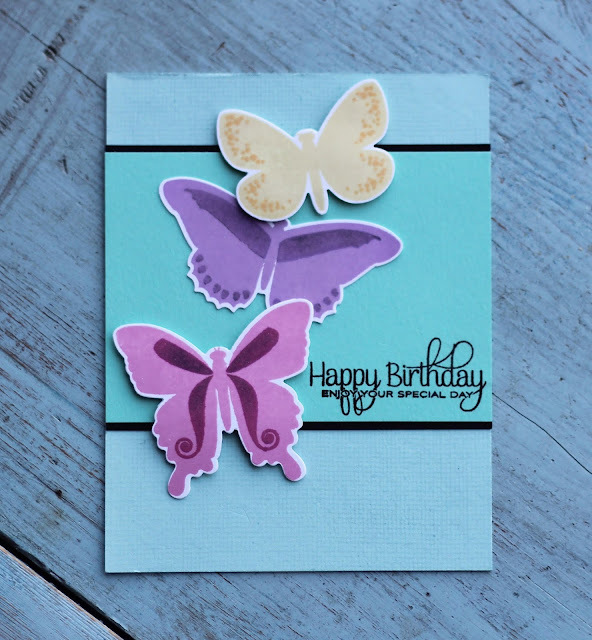 I pulled out some Papertrey ink Butterflies to make my card!! Of course using my go to colour combo from Wplus9!! Fall to Layout #56 Take Two! It's a long weekend here, so I am loving having the extra day to get some crafting in! This card is also my entry for one of the Olympic Challenges over at My Favorite Things. It's for the 20 minute challenge. One of the great things with doing a sketch is that most of the guesswork is gone since you have your layout. You just have to find some paper, ink,and stamps. I absolutely love this sketch! It's so simple but yet so elegant!! I also realized that MANY of my cards are purple. In case you didn’t notice I love purple!! Love it! So I told myself this sketch was not allowed to be purple…. (might have to make another one tho that is purple. hehe) For this card I pulled out Papertrey Ink bitty bouquet set! I love this set I’ve used it many times but every time I use it I think I should use it more! 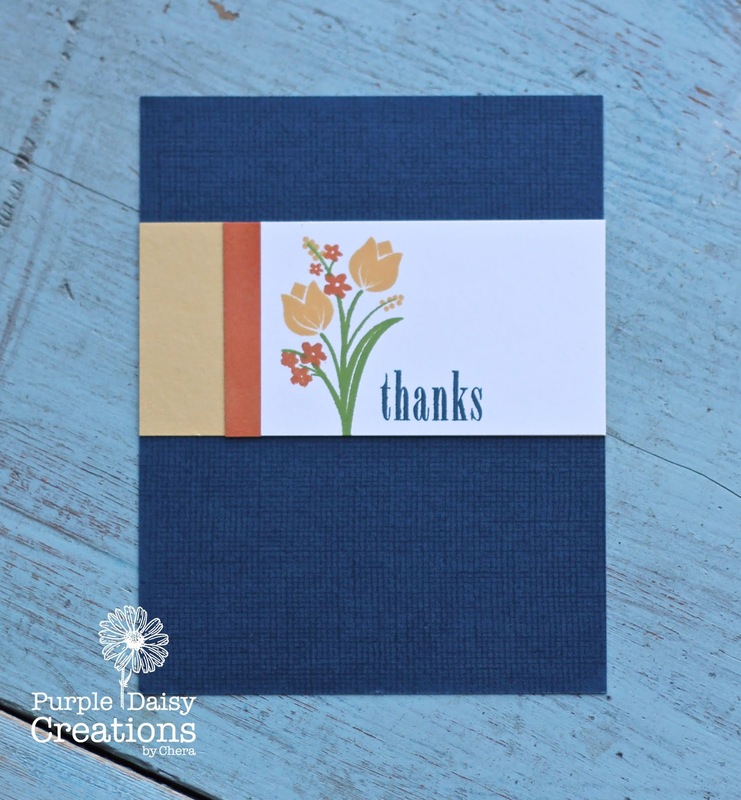 The ink colours for this card are Wplus9 wild mango, pumpkin spice and nautical navy. The green is from Simon says stamp green leaf! Hope you all are having a wonderful weekend! Thanks so much for stopping by!! I think Chera and I are wintered out. You may notice a certain Spring vibe in our cards today! The original idea when sketched was to coordinate the pattern paper with the larger focal image. The "button" part of the sketch can be anything- just ribbon, an actual button, or a bow or knot. I don't typically combine challenges, but when I saw that the Beautiful Butterflies set was on the Papertrey Ink 2018 retirement list, I had to use it for the retirement list challenge! This set has served me well over the years. 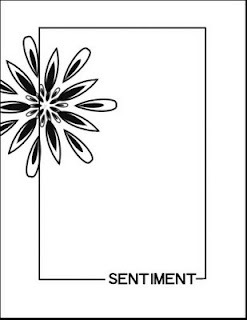 I love the sentiments in and have made many birthday, wedding, and mother's day cards with it. If you love it, but don't have it, check out the link above- it can still be purchased until May. After that it's gone for good! I mixed the old, with the new (kind of). 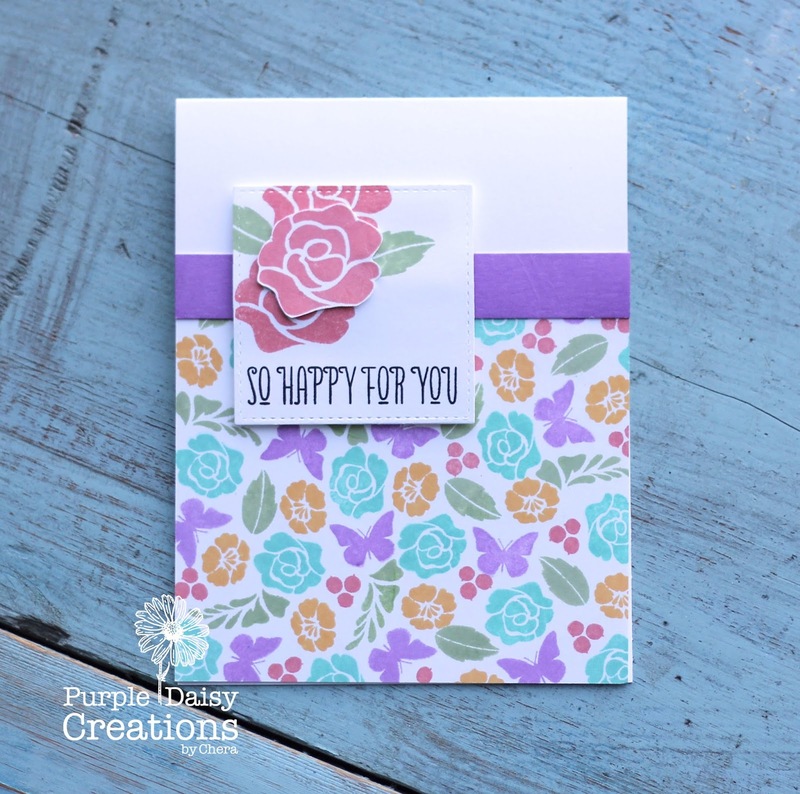 Lilac Grace is a colour that was released a bit more recently and I hadn't even cracked open my pack of cardstock! I arranged the smaller butterflies on my MISTI and stamped a nice background with them. I rearranged them a few times to fill the whole panel. Next, I stamped the large butterfly on my image panel. To make it a bit more interesting, I cut out the one side of the wings so that it would "fly" off the page. I stamped my greeting over the butterfly and then also added a bit of white Nuvo drops to the wings. 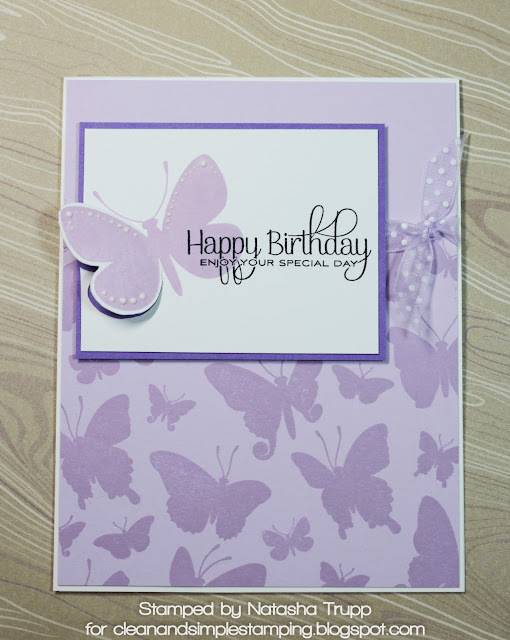 The image panel was placed on some Amethyst Allure card stock and then the card was finished off with a touch of light purple sheer polka dot ribbon. Hello Everyone! Hope you had a great week!!! Here's my card for this week's sketch! Pulled out some oldies (which I seem to do often) This set is from Wplus9 called Mother's Day Bouquet. I used the smaller images from the stamp set to create the background base for the card! Just another way to utilize smaller stamps and create your own designer paper in whatever colours work for you!! Once that was done I then cut out the square using a MFT stitched die and stamped the flowers onto it. One of the flowers I cut out by hand and popped up with a glue dot to give a little dimension to it! After that was stamped I pulled out another oldie from Wplus9, strictly sentiments 2, as it fit perfectly inside the die cut square! Once that was done I cut a strip of white paper and used my purple ink pad to colour it for the perfect match! Look forward to your creations this week! Thanks so much for stopping by! This week's sketch is another one that has the potential to be a one layer (or mostly one layer) card! When I originally designed this one, the idea was to draw a thin-lined rectangle on the main layer, leaving a gap for the sentiment. 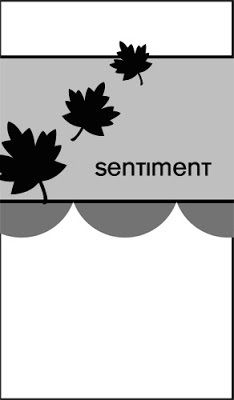 The image element can be placed in a gap as well, or popped up. Here's my card. I was in the mood for a birthday card. Originally I was going to just have the one red balloon, but it felt a little too lonely. So I added the orange one. And then I just couldn't deal with having an even number, so the third yellow balloon was added. The little stars are from the same stamp set and I thought they added some fun interest. They also helped cover a few stray ink boo-boos. It never fails hey? Making a one layer card and you get some stray ink transfer somewhere. Grr! 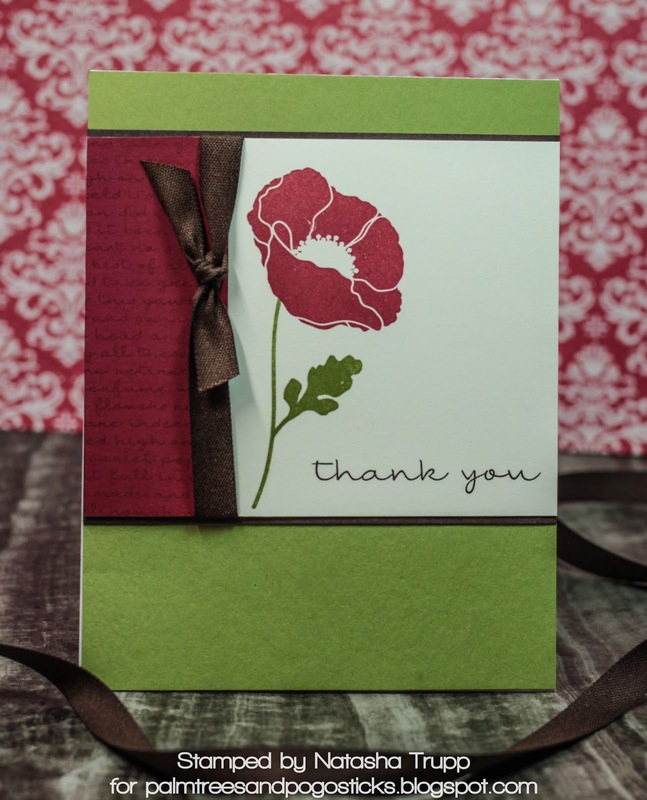 Embossed stars to the rescue! Accessories, etc. : Micron .5 pen, silver embossing powder. Hey Everyone! Hope you all had a wonderful week!!! Here's my take on this week's sketch card! It was recently my husband's birthday and this was the card I made for him!! Gave me an opportunity to showcase some Concord and 9th plaid background!! I just can’t get enough! Wanted to keep it masculine and I find a neutral tone on tone good for that!! 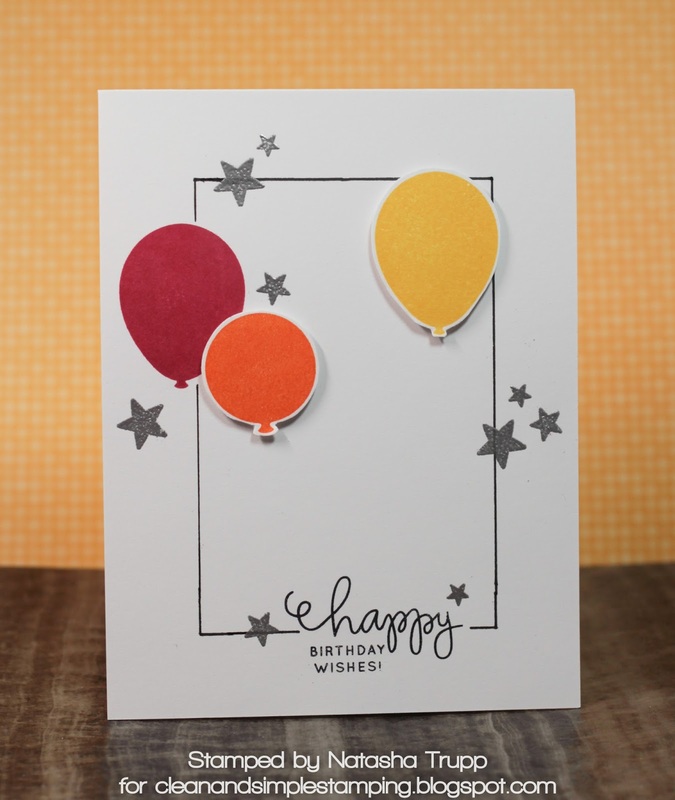 For the white panel in the middle I wanted it to say something about birthdays so I found an old wplus9 set and stamped birthday wishes diagonally on the there in wplus9 fairy dust ink, so it was super light but still visible! 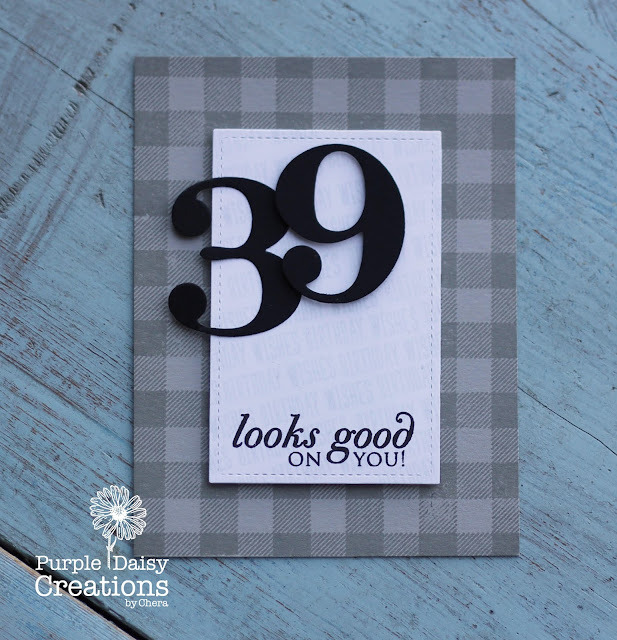 I then die cut the numbers using a set from Paperytrey ink along with the bold sentiment on the bottom as well. Hope you feel inspired! I look forward to see what you create! !